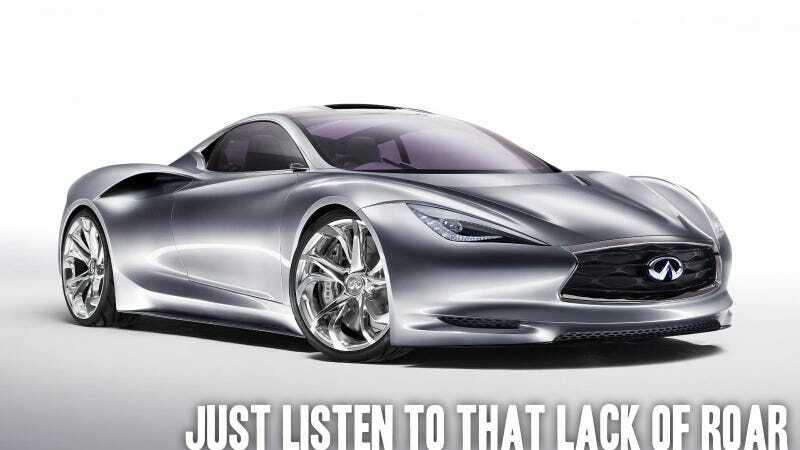 This new concept is the first time Infiniti's ever tried to build a mid-engine car. Adding to the complexity, it's the only one by any manufacturer where the mid-mounted engine doesn't actually drive the wheels. Infiniti's Emerg-E concept, while named like a powder you'd mix in water to help ward off colds, is the brand's first mid-engined, range-extended electric sports car. The Emerg-E uses two 201 HP electric motors, one mounted at each rear wheel, for the business of going; these motors are fed from a lithium-ion phosphate battery pack good for an electric-only range of 30 miles, after which the Lotus-sourced 1.2 liter, 46 HP three-cylinder engine kicks in to act as a range extender, giving a total range of 300 miles. Infiniti says the Emerg-E will make 737.6 lb-ft of torque, good enough to get the car to 60 in 4 seconds, and then, if you're really in a hurry or being chased by cyborg bears, all the way to 130 in 30 seconds. Like many electric motors, that maximum power is a "peak" power, and not available always and forever; Inifiniti specifies that the full power burst is only good for 30 seconds or less, suggesting that if you could somehow ignore or push that, you could accelerate beyond 130 mph. We'll have to test it in a special climate controlled warehouse to see for sure. Styling-wise, it is a very striking vehicle, with the usual Inifiniti baroqueness cut with a bit of Mitsuoka Orochi snuck in there. Though this is the first Infiniti concept developed in Europe, the design came from Infiniti's California design studio. The bodywork is highly fluid and suggests fabric drapery, with graceful curves and deep folds and creases; the designers reference the "furl of the neck of a Kimono" as an influence. The press release goes a little off the new-age deep end, suggesting that the lights are "suggestive of human insight" and mentioning things like "Energetic Force" and "Dignified Intelligence" in creepy, breathless tones. Press release hyperbole aside, the car certainly has presence, and the unique, powerful yet languid forms of the body are engaging and would prove a distinctive look for the company. "Silence is the new vroom," is a quote from their press kit, and while I'm not so sure I agree with that (you have to make some sounds with your mouth when you're pretending to drive) it does give a pretty clear idea of where many premium luxury brands are headed. Electric/hybrid sportscars are a great idea, but I'm glad not everyone's as, um, ethereal as Infiniti.